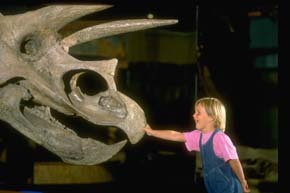 As we all know, dinosaurs fascinate children and adults alike. An ancient form of animal life that became extinct approximately 65 million years ago, these ancient (now fossilized) life forms have been a major reason why paleontologists — professional and amateur — travel to Alberta. 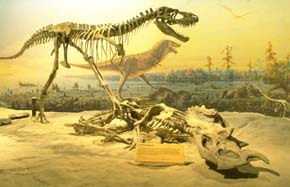 But the dinosaurs and especially Alberta's Royal Tyrrell Museum and Dinosaur Provincial Park attract many other travellers each year and become a focal point for a visit to this western province of Canada. Here you can observe real examples and recreations of how life may have looked in the past, and get a new awareness of time and the life of this planet. Imagine you walked around the corner of a ravine and found what looked like a shiny piece of rock sticking out from the face of the cliff. What you have really found is the tip of a serrated tooth from a meat-eating dinosaur, possibly an Albertosaurus. It is probably at least 65 million years old and you are definitely the first person to have ever seen it. Imagine the feeling that would create in you. Now imagine that after carefully looking around, you also started to find other pieces of material that were identified as bone, perhaps another tooth fragment and maybe even a complete lower jaw. That could be your experience if you were participating in one of the Badlands Science Camps conducted by the Royal Tyrrell Museum in Drumheller, Alberta. There are three different camp opportunities especially tailored to different age groups. The first is a Junior Camp for ages 9-11, another is the Science Finders Camp for ages 12-14 and the third option which is sure to prove popular is the Family Camp for all ages — because adults really enjoy this too! 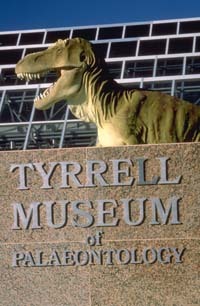 Full details on these opportunities are available by viewing the Tyrrell Museum's Program Page. If an extended stay in the field is not your thing, the museum's website will also show you other exciting programs and will give you background information on this region of Canada that demonstrates why it is such a popular travel destination. 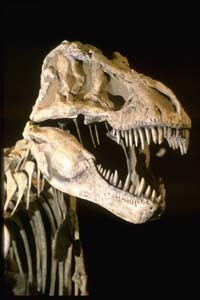 The Royal Tyrrell Museum in the heart of the Alberta Badlands has long been known for the quality programs it has run over the years. 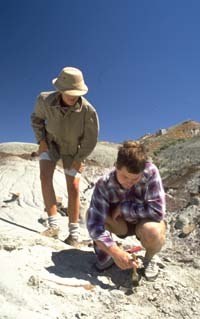 I personally attended five sessions with Paleontologists in a program called “Field Experience.” In this environment, volunteers had two options, one to stay in construction trailers at Dinosaur Provincial Park and help excavate known sites in the park. The second option was to spend a week in a tent that participants provided themselves, in a remote area that usually had a cook house and water transported to the small tent village. From this venue participants were fully involved in carrying in materials and equipment to a site of interest and assisted in excavating a “bone bed.” The latter term describes an area where a part of a skeleton has been found and has possible scientific value to the museum. Voluntourism is a relatively new but rapidly growing area of the travel and tourism industry and what I have described above is an example. 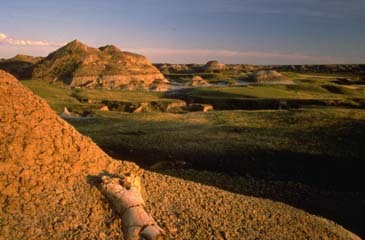 If you are just visiting Alberta, however, you will discover that the Badlands and the focus on dinosaurs make for a fascinating experience and superb family travel. 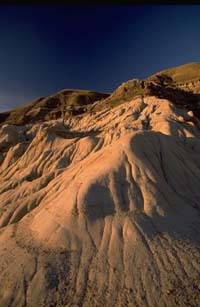 Why do we find dinosaurs in Alberta, Canada?